When in Laos I often make a request for either Lao Bamboo shoot Soup with no meat or fish in it but a lot of mushrooms and vegetables. It is one of my favorite dish next to green papaya salad. 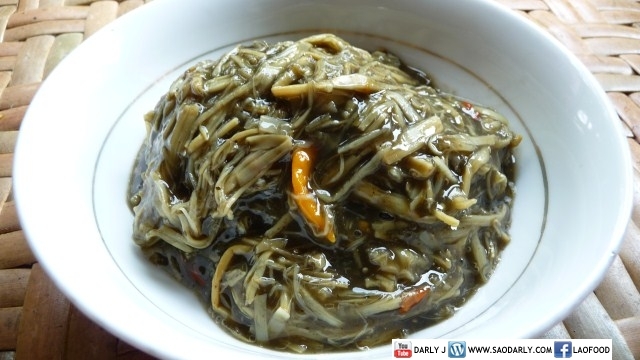 The next dish I would also add to my list of Lao food to eat is Fried Bamboo Shoots with Yanang leaf extract (Khua Nor Mai Sai Yanang) with no meat. It’s a perfect meal with warm sticky rice and chili dipping sauce. I would wrap Fried Bamboo Shoots in betel leaf and dip in chili dipping sauce. I also like the bamboo shoots with yanang leaf extract wrap in banana leaf and steam or grill with various herbs and spices. If you are interest in making the dish. You can try a recipe from Food from Northern Laos and Lao Cooking and the Essence of Life cookbooks.